String the first round of beads and pass through them again to form a circle. Start a new round by stringing 2 beads; pass through the last bead of the first round and through the 2 beads just strung. Repeat all around, passing through the next bead of the previous round for each 2 new beads strung. 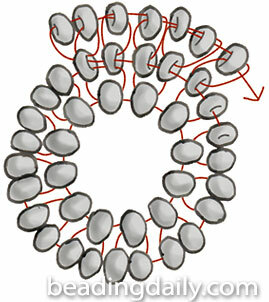 At the end of the round, pass through the whole round again to tighten the beads. Start a new round by stringing 2 beads; pass through the last bead of the previous round and through the 2 beads just strung. String 1 bead and pass through the next bead of the previous round and the bead just strung. Repeat around, stitching 1 or 2 beads to each bead of the previous round, adjusting the count as necessary to keep the work flat.